Hi Friends! In South India curd rice is eaten as a part of meal. It is a great summer food too. Two main ingredients to make are Rice. In telugu it is called daddojanam and thayir sadam in tamil. I am sharing a simple method of making it today. Well cooked rice is mixed with curd and then seasoned to make it tasty and flavorful. Wash rice well and soak in 2 cups of water for 20 minutes. In a pressure cooker take the soaked rice along with the water soaked in, add salt .Close the lid and place the cooker on high flame. The moment full pressure is formed, switch off the stove. Let the pressure cooker come to the room temperature , open the lid take out the rice mash lightly with a ladle. Add milk and bring the mix to a boil, reduce the heat to low flame. Cook the mixture for ten minutes . Cool the cooked rice. In a pan, take oil add hing hen slightly pink in colour add mustard seeds, when mustard begins to splutter, add urad dal and fry until light golden, add chili and curry leaves. Switch off the stove. Pour the seasoning on the curd rice, mix well. Curd rice is ready to be served with lime or mango pickle and papadams. How good is curd rice for your health? Improved Digestion: The nutrients present in curd rice are easily get absorbed by the digestive system. This is due to the curd will help in absorbing nutrients from rice that you have eaten. No more heart diseases: It minimizes the risk of high blood pressure and helps reduce cholesterol levels by preventing the thickening of carotid arteries. Great meal for those who are lactose intolerant: Some people, who cannot consume milk because they are lactose intolerant, can safely consume curd based cuisines. It converts the lactose present in milk to lactic acid, making it easier to digest. Also, you do not lose out on the nutritional boost that milk provides. Improved Immunity: When you have curd rice, you are actually increasing your Immunity . It has many good bacteria which are able to fight against the micro-organisms in our body. Improved teeth and bone care: Like any other milk products, the curd rice has the high amount of calcium and phosphorous which are essential for teeth and bone strength. It would also prevent osteoporosis. Curd rice ( Tamil: தயிர் சோறு, Kannada: ಮೊಸರು-ಅನ್ನ (mosaru-anna), Telugu: పెరుగు అన్నం, Malayalam : Thayiru) also called the state of Tamil Nadu it is called “Thayir Sadam”. “Thayir”=Curd, “Sadam”=rice. hi friends, here is a simple recipe of curd rice/ yogurt rice.While it is most easily prepared by simply mixing boiled rice and yogurt, different methods can be used . One of these recipes is given here: Rice is boiled so that it breaks down, becoming almost like a paste. Bring it to room temperature. It is then seasoned with fried red chilies, and curry leaves, and along with the urad dal , mustard seeds, and asafetida. Alternatively, it can be prepared by mashing cooked plain rice (can also use leftover boiled rice), and then mixing it with some salt, yogurt and (a bit of milk to lessen the sour flavor of yogurt or to stop it from souring too much) garnishing it with fried urad dal, mustard seeds, green chilli . 1. It boosts digestion and works best for stomach upsets, indigestion and bloating. 2. It’s a good natural substitute for pro-biotic and antibiotics for very young children during early stages of fever. 3. Has the mercury risen too high for your comfort? Just add some curd to your diet and you will feel better. 4. Curd is also a natural fire extinguisher after a very spicy meal. A small cup of curd will keep those spice tears away. 5. It’s high in calcium and good fats and a must have in high protein diets. It increases immunity and the defense mechanism of the body. 8. It improves the absorption of vitamins and minerals from other foods in your body. 9. It’s extremely versatile in flavor and makes for a healthier substitute for milk and cream in your desserts and savory dishes. Rasam, chaaru, saaru or kabir is a South Indian soup traditionally prepared using tamarind juice as a base, with the addition of tomato, chili pepper, pepper, cumin and other spices as seasonings. Steamed lentils can be added along with any preferred vegetables. Hi friends ! Rasam is a thin, very spicy southern Indian soup served with other dishes, typically as a drink. In this recipe I have made Rasam with lentil and tomatoes. Soak the tamarind in hot water for ten minutes and extract the pulp. In a pressure cooker take cleaned and washed Pigeon pea lentil / toor dal , add chopped tomatoes and tamarind extract , two cups of water, and salt. Place the cooker on high flame, when full pressure is formed reduce to low flame for fifteen minutes. Let the pressure cooker cool down to room temperature, open the lid. Remove the cooked contents in a blender and blend into a smooth paste. Remove in a mixing bowl and keep aside. If preparing Rasam powder , roast lightly peppercorns, cumin seeds, coriander seeds, red chili powder, cool and grind into fine powder. Keep aside. add the curry leaves, and crushed garlic. Sauté for few seconds. Add the cooked dal and tomato water to t the seasoning add Rasam powder. Bring it to a boil, reduce the heat and let it boil for 7-8 minutes on a low flame. Add finely chopped Cilantro /coriander leaves, serve hot with south Indian papadams. All the ingredients required for home made Rasam powder are combined and ground beforehand into rasam powder and can be stored . Nowadays, Rasam powder which is available commercially are good and time savers. Rasam can be served with rice in a traditional meal . It is served with a sambar, fried vegetables, rice course and is followed by curd rice or separately as a spicy soup. Rasam is both, delicious and healthy. Include it in your diet for many health benefits. The benefits of rasam come from its major ingredients – tamarind, tomato, and black pepper. Rasam contains tamarind that is rich in dietary fibre or non-starch polysaccharides, such as mucilage, pectin, hemicellulose, tannin and gums. It adds bulk to food and eases bowel movement. Thus, easing constipation. The ingredients in rasam, especially tamarind, are rich in antioxidants. Thus, it protects the body against attack of free radicals. The skin remains young, supple, and healthy. The nutritious properties of rasam and its fluid consistency make it an ideal food for convalescing patients. By adding lentils and vegetables, the protein and nutrient value of rasam can be increased. Pregnant women will also find rasam to be a good meal that will give them essential vitamins, minerals, antioxidants, and proteins. It is also easy to digest and keeps the intestines working properly. Babies can be introduced to rasam as their first solid food because it is easily digestible as well as tasty. Semi-solid food is the best type of food for a baby who has recently been weaned off mother’s milk. Rasam is rich in essential vitamins such as thiamin, folic acid, vitamin A, vitamin C, niacin, and riboflavin. Some of these vitamins act as antioxidants as well, keeping the body healthy. Being a fairly good source of minerals, rasam is an ideal food for people to include in a balanced diet. Potassium, iron, calcium, zinc, selenium, copper and magnesium are the minerals provided by a serving of this delicious food. The black pepper content of rasam is what helps the body lose weight. It promotes removal of toxins by making the body sweat and produce more urine. Thus, the body’s metabolism is kept working properly. Regular consumption of rasam may help keep cancer away. Black pepper present in rasam contains a substance called piperine. This substance has been found to have an inhibitory effect on cancerous cells, along with curcumin found in turmeric. Rasam plays the primary role of promoting digestion. Its black pepper content ensures that the stomach is signaled to produce more acid. This helps digest food, such as proteins better, and prevents flatulence, indigestion, gas, constipation, acidity and diarrhea. Making healthy meals does not have to be time-consuming or unpalatable. Rasam is one of the best foods to be eaten when planning a balanced meal. Partake of this dish and revel in its delicious taste! In the Eastern cultures, especially India, fenugreek leaves are more widely used as compared to seeds primarily due to its immense nutritional benefits. While the seeds of this plant are used only for the flavour, the leaves have herb nutrition value in them. Hi friends ! Methi Aloo is a delicious dish made with fenugreek leaves, potatoes and a combination of spices. Fenugreek is a green leafy vegetable with a unique taste that is packed with nutrients. There are many health benefits of fenugreek. This dish is delicious in addition to being healthy! Wash peeled and cut the potatoes in small cubes and soak them in water. Wash the Methi /fenugreek leaves and chop them finely, keep aside. Heat the oil in a wok / heavy bottom pan over high flame. When a little smoke starts emitting from the oil mustard oil is ready reduce the flame to low. Add asafetida powder and then add finely chopped methi / Fenugreek leaves ,potatoes stir. Add red chili powder, and salt. Mix it well and cook uncovered for the first 8-10 minutes on slow flame. Now cover and cook until potatoes are tender and well blended with Methi /Fenugreek leaves it should take about 12-15 minutes. Keep stirring intermittently . After potatoes cooked well, switch off the stove. Serve Methi Aloo hot with any Indian bread of choice. 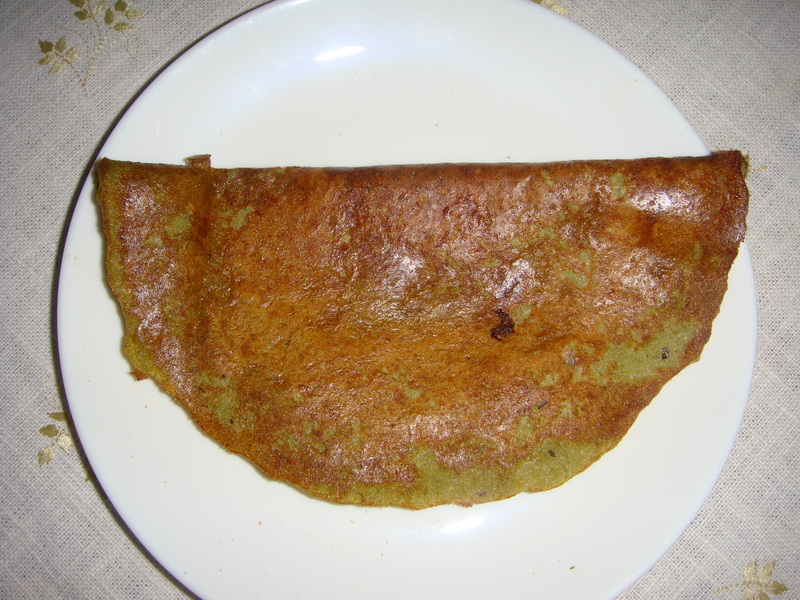 Uthappams or ooththappam or Uthappa is a dosa-like dish made with a batter. Unlike a dosa, which is crisp and crepe-like, uthappam is a thick pancake, with toppings cooked right into the batter. 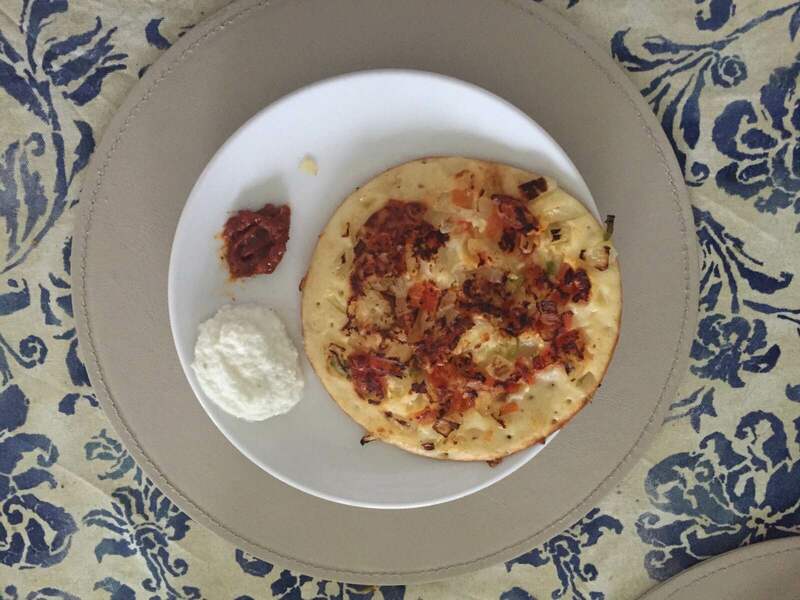 Uttapam is traditionally made with different toppings such as mixed vegetables, tomatoes, onion/ shallots, chilies, cabbage, coconut etc. It is generally eaten with sambar or chutney. Hi friends ! Instant uthappams always salvage the situation when nothing is planned for breakfast. Here is the most simple, easy and never failing instant uthappams recipe for you all. In a mixing bowl mix all purpose flour/ maida ,suji rava/semolina ,rice flour, salt , baking soda. Add to step1 mix whisked curd / yogurt / Dahi and gradually add sufficient water to it and mix until lump free batter is formed. The batter should be thick but of pouring consistency Keep this aside for 15 minutes. Add green chili paste, cumin seeds and finely chopped coriander/Cilantro leaves, and mix it well. Pour a ladle full of batter on a hot non stick tawa /gridle spread it in a circular motion on the tava lik we make a dosa taking care that the quantity of batter will be more than a dosa as the uthappam is thicker. top the uthappam with a handful of the onion, and tomatoes . Pour 1 tbsp oil approx over and around the uttapam, cover it with a lid and cook for 1 -2 minutes on medium flame. Turn / flip the uthapaam when cooked on one side. The onion, tomato side gets cooked flip it back this side also gets cooked and light golden brown in colour. When the uthappams are crisp and cooked on both sides, serve hot with hot sambar and coconut chutney. Uthappams can also be served with coriander chutney . These uthappams are best eaten hot because cold uthappams turn soggy. when on high flame do not pour the batter on the hot non -stick tawa / gridle . Reduce the flame to low before starting to pour the batter for the next uthappam. Always stir the batter before pouring for the next uthappam. There are many instant variety dosas like Rawa doas, BesanDosa, Wheat flour Dosa and Oats Dosa to name a few. Traditional Indian recipes are very tasty, quite nutritious, many are low in calories and fat if prepared at home. These days, the trend of eating out in restaurants has gone up. The food available there may not be as nutritious and low in fat and calories as that prepared at home. Also the quality of oil may also be open to discussion. It is not known if the restaurant cooks are using same oil repeatedly many times. Reusing oil for frying repeatedly will make the recipes unhealthy. It is therefore prudent to do home cooking and enjoy! 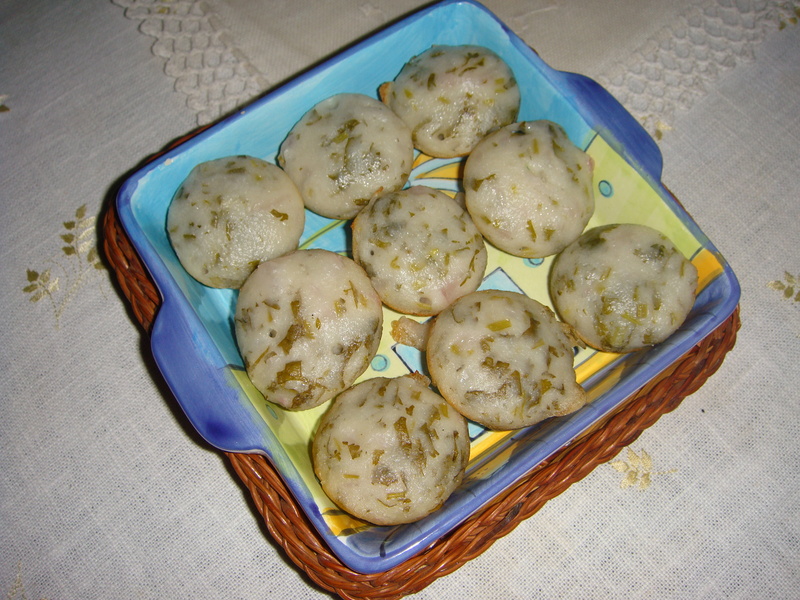 Paniyaram /spiced dumplings originated in Tamil Nadu ,south of India, these are made in a special utensil or cookware called paniyaram chatti which have molds in it like a muffin pan . It is the traditional cookware used for making the paniyaram / spiced dumplings and gives the them round ball like appearance. It is made with rice and black lentil/ urad dal batter . These are basically called appams or spicy dumplings, and are generally served for breakfast or as a snack. These are also known in South India as Kuzhi paniyaram ,appe, guliappa, gulittu, and gundponglu, etc. The batter is made by soaking the ingredients like rice, black lentils and Fenugreek seeds overnight in water, grinding the contents, then letting the batter ferment. Salt is added after mixing, the batter and is poured into the cookware pan’s compartments and placed on a low flame. After couple of minutes, the appams / paniyaram / spiced dumplings are flipped over to cook from the top . The Kuzhi paniyaram /spiced dumplings are ready to serve when they turns golden-brown all around . Hi friends !masala paniyaram/ spiced dumplings are very easy to make. These can be made with leftover idli batter at home. There are different versions of masala Paniyaram / spiced pancakes. Here is one recipe for you to enjoy! In a mixing bowl take the left over batter , add coconut, onions, green chili, ginger, carrot and salt, mix well. On a medium flame heat the paniyaram chatti/ dumpling cookware with circular moulds . In each mould add a drop of cooking oil. Take a spoonful of the batter mix and put in each mould leaving 1/4 of the mould empty. Reduce the heat to low flame and allow the batter mix to cook for 1-2 minutes. When the batter is firmed in the moulds, turn each paniyaram/ dumpling, in each mould with the help of a skewer or tip of the knife so that the other side get cooked and becomes golden brown. Check the paniyaram/ dumplings for even cooking, turn once or twice for uniform cooking. Remove the cooked paniyaram/ dumpling from the cookware mould and serve hot with coconut chutney / sambar or both chutney and sambar. Note: Many variations can be tried with the basic recipe. Hi friends! Here is one more recipe for healthy breakfast. Dosa is one of the most popular Indian breakfast. There are many varieties of Dosas . Dosa is like a pancake. This recipe of Moong Dosa or Pesarattu is a healthy and delicious breakfast recipe of Andhra Pradesh. It can be served with Upma. Wash Moong sabut / Green gram whole well. Soak the Moong sabut / Green gram whole overnight in 500 ml water. Grind the soaked and drained Moong sabut / Green gram whole , asafetida, green chili, ginger, coriander leaves, salt with some water into a thick smooth paste. Remove the batter in a mixing bowl. Add the rice flour to the batter and mix well. Place a non-stick tava / griddle over medium flame. Grease the non-stick tava / griddle lightly. Test by sprinkling a few drops of water on it if water sizzles right away non-stick tava / griddle is ready for making dosa. Pour a ladle full of the batter mixture onto the non-stick tava / griddle and spread evenly with the back of the ladle, about six to eight inches in diameter. Sprinkle some of the finely chopped onions, green chilies and coriander leaves. Drizzle oil at the sides and in the center. When the batter begins to dry a bit, gently pour one tsp of oil over and around it again. Wait for about 20-30 seconds, then flip the dosa using a spatula. Press the dosa very gently with the spatula all around to ensure even cooking, when dosa is golden brown on both sides. Flip it over again and add a big spoonful of mixed vegetable upma in the center of the dosa /pesarattu, fold it once with the help of spatula and remove from non-stick tava / griddle, slide it gently on a plate. Sprinkle some water on the non-stick tava / griddle, and repeat this process for making the remaining dosas /pesarattus. This batter gives approx 6-8 Dosas /pesarattus. Serve hot. Coconut / cilantro/ coriander chutney is an excellent accompaniment to this dosa . Here is a super food I really love and enjoy not only because it keeps me full but it also helps me lose weight. It has many properties that are beneficial for us especially when we are starving ourselves in the name of being on diet. Yes, I am taking about the good old Green Gram or Green Moong. We can have it in many forms. We can soak it and make a healthy dal to have with roties or brown rice, we can sprout it and make a healthy salad from it. There is also one interesting way that I doubt most are not aware of; we can dry roast the dal and dry grind it into flour to make some healthy and tasty roties/ parathas or wet grind it to make healthy versions of dosa, idli or uttapa. It’s loaded with Goodies: It is rich in Vitamin A, B, C and E and also in many minerals including iron, calcium, and potassium. Not to forget it is a powerful source of vegetarian protein. It good to Shed Some Unwanted Weight: It is considered a healthy weight loss food as it is a low fat food rich in proteins and fibre. It curbs cravings and keep us full for a long time. It detoxifies the body and benefits the metabolism as well as immune system. It’s good for the Heart: It helps to lower the high cholesterol level in the blood system. Regular intake of Green Moong reduces bad cholesterol and improves the flexibility of arteries and veins. It also regulates the blood pressure. Keeps a check on the Blood Sugar Level: Green Moong is full of complex carbohydrates in form of high fibre, which aids digestion. Complex carbs also stabilizes blood sugar and controls its sudden rise after meal, while keeping body’s energy at a balanced level. Green Moong can be highly beneficial for people having a high blood sugar level. It’s Anti-fungal, Anti-bacterial and Anti-Cancer: Green Moong contains Vitamin B-1, Vitamin C and Vitamin B-6 (pyridoxine). Regular consumption of diets rich in Vitamin-B6 help you develop resistance against contagious agents that cause diseases. As per Ancient Chinese medicine it also contains anti-cancer properties. Moong bean dry grinded powder serves as an effective facial scrub or face mask. It makes skin smooth and youthful while minimising skin problems like acne, spots, tan or wrinkles. It is mild enough to be used as a daily face cleansing agent. For dry skin add milk or cream or honey to it. For oily skin add rose water or tap water to make a paste. Apply a thin layer and wash off when it dries. You can add a pinch of turmeric powder for a natural glow.